By the way, if you seriously have a ton of CDs that you'd like to get rid of, then today's the perfect day for you! 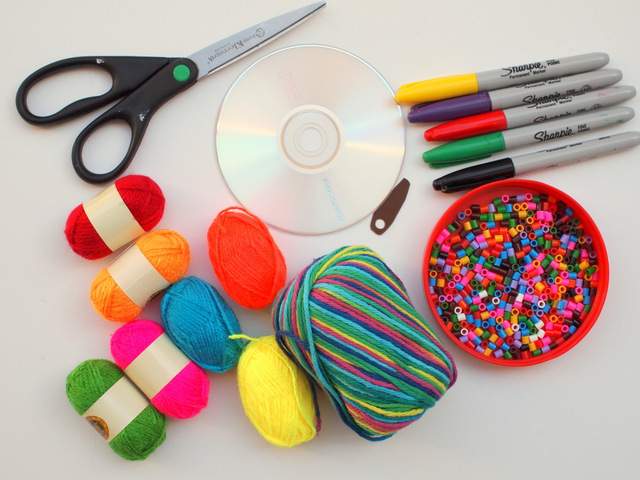 Several other kid-craft loving bloggers and I are sharing some easy and fun CD crafts, just perfect for kids of all ages! 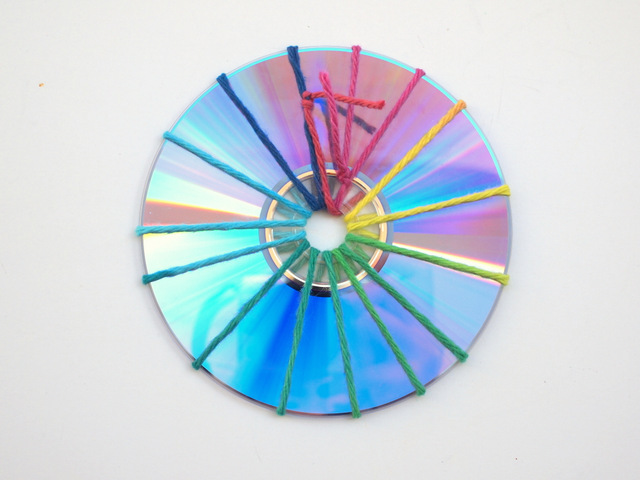 So be sure to scroll down to the bottom of the page for some more CD crafts, like this neat Spinning Top CD Art idea! Now there are quite a few cd weaving tutorials out there. 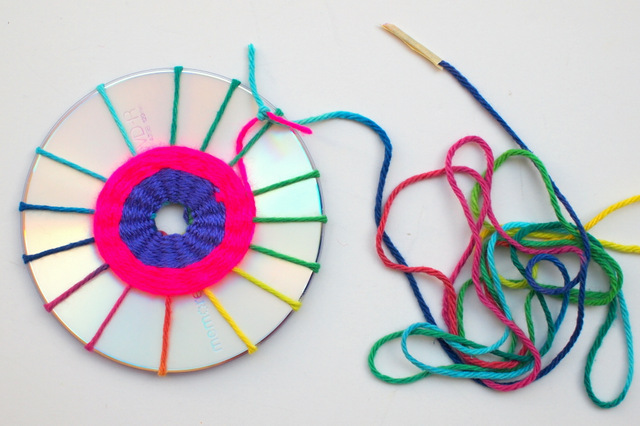 I found this cd weaving tutorial particularly helpeful. If you're planning on doing this activity with children, definitely check her site out! She gives great tips on how to adjust this activity for children of all ages. Plus, she also shares tips about the pros and cons of different types of yarn too! First, we're going to put on our warp strings. Cut a piece of yarn (about 6'). Then, tie it to your cd. (I tied the knot to the shiny side because that was my back side.) 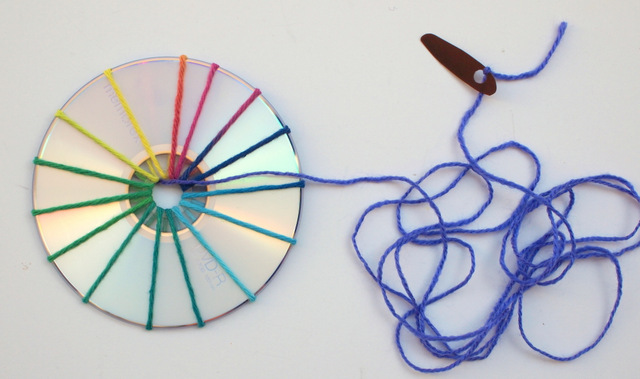 Then, wrap your yarn an odd number of times around your cd. (I wrapped mine 13 or 15 times.) Make sure to pull the warp strings tight. Then, tie your string in place. Now weave! Simply go over one warp string and then under the other warp string. Keep repeating this process, making sure to pull your string tight as you go. Sometimes I used my plastic lid needle and sometimes I used a piece of masking tape (when I wanted to add beads.) When you switch strings, simply tie the new yarn to the old yarn and then trim the strings, leaving a little bit of ends left. Hide the ends under your weaving and no one will be able to know that it's there. And when you're adding beads, be sure to add one at a time! Keep on going! When you're finished, tie your string to a warp string and hide excess bits under your woven circle. Then, use a Sharpie to add your final touches! 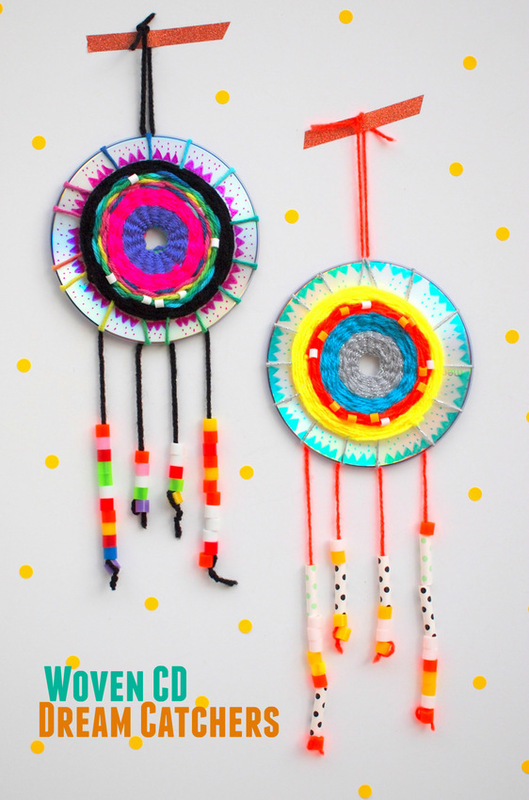 You can keep them as they are, or turn them into dream catchers! To turn them it into dream catchers, tie on strings and beads as shown below. 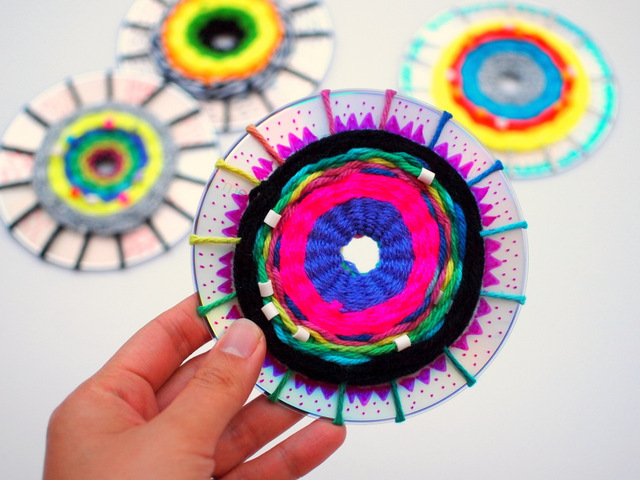 Looking for other fun CD crafts? Well, you're in luck! Today's post is part of a kids crafty challenge! 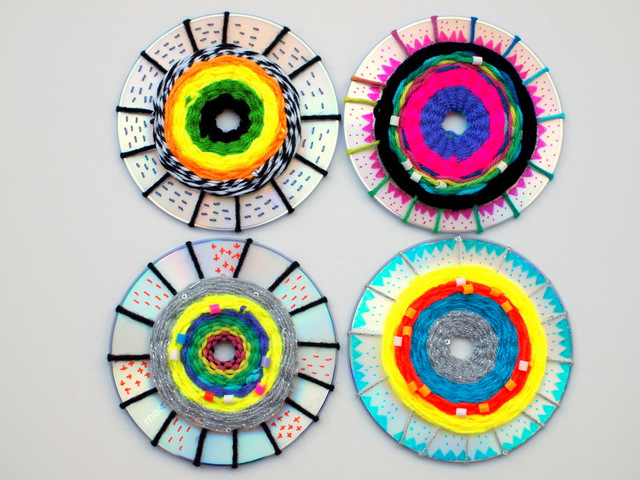 Here are 10 other ways to make cute kids crafts with CDs! It's such a good tutorial. :) Thank YOU for sharing it with all of us! We made these in my Library last night! :) Awesome! Thank you so much for letting me know! They look great!!! I want to make these with my gran girls. Is there any way to print out just the directions?